Sandwiches & Toasts There are 11 products to choose from. Takeaway Lanzarote - Restaurants Playa Blanca Sandwich Mixt : Ham and cheese. Takeaway Lanzarote - Restaurants Playa Blanca Sandwich Capricho -Ham, cheese, egg and tomato. Takeaway Lanzarote - Restaurants Playa Blanca Tuna, tomato, lettuce and chips. Takeaway Lanzarote - Restaurants Playa Blanca Sandwich Jumbo Chicken,lettuce,tomato,onion,cheese,ham,bacon,egg,ketchup-mayo sauce and chips. Takeaway Lanzarote - Restaurants Playa Blanca Chicken, lettuce, tomato, ketchup-mayo sauce and chips. 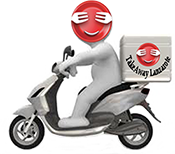 Takeaway Lanzarote - Restaurants Playa Blanca Offers & Discounts for Burger Playa Blanca Lanzarote Burgers Delivery Playa Blanca Lanzarote.